Born in 1931, Lance grew up in Richmond, Surrey and came to know the Lord at twelve years of age. He entered the school of African and Oriental studies at London University to prepare for work in China. He studied Classical Chinese, Mandarin, Oriental Philosophy and Far Eastern History, but the revolution closed the door to European missionaries and his entry into China. In the early 1950's Lance served in the Royal Air Force in Egypt and later founded Halford House Christian Fellowship in Richmond, England. Having discovered his Jewish ancestry Lance became an Israeli citizen in 1980 and now has his home next to the Old City of Jerusalem. His father and many members of his family died in the Holocaust. Lance is noted for his eschatological views, which place him in the tradition of Watchman Nee and T. Austin-Sparks. 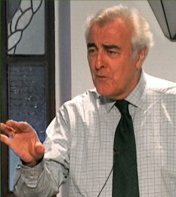 He produces a widely appreciated quarterly audio recording called the Middle East Update, which gives his unique perspective on current events in the Middle East, in the light of God's Word. He has written numerous books including The Uniqueness of Israel and is presenter of the video production, Jerusalem, the Covenant City.